The Idrisian Sphere concerns the affairs of five large territories, nations, and alliances that exist due north of the Known World. This is the fourth product in a series of unofficial Gazetteer gaming aids designed by and for enthusiasts of the world of Mystara. This work covers the Kingdom of Ghyr, a country west of the Icereach Mountains that define Norwold’s limits. It also covers the neighboring nations of Greendale and Deep Hollow. “The Hidden Treasure of Ghyr” provides descriptions of the history, nations, races, and personalities of a land where men and women take up arms in the cause of valor and justice, where temptresses seek to pull away the righteous, and unclear hearts can destroy all that is held dear. This product ties together the Idrisian storylines presented in the previous three gazetteers. It also provides new rules for jousting and extended guidelines for playing paladins, avengers, and knights. The Idrisian Influence: As a mortal, Idris brought about the destruction of the Realm of Forenath in the Northern Wildlands, and human and elven refugees fled north to the Parthenal Hills. Early Denagothian and humanoid followers of Idris formed the Dominion of Maggorath center in the Swamp of the Beast. The expansion under Maggorath and his descendants put the Dominion in conflict with the Parthenal elves and sparked migrations among the frogfolk and Icereach giants. The predatory Dominion was ultimately defeated by the early followers of He Who Watches, but cooperative tendencies remained common between humans and humanoids. Since that time, Idrisians have served as a source of temptation to nihilism, hedonism, and other spiritual ills among the peoples of the Hill and Dale. Languages: Thyatian, Roag, Barkyip, Essurian, Dwarvish, Elvish (Lothenar, Vyalian, Parthenal), Gnomish, Hymsprach, Bullrip, Meggaran, Hillbanic; others used in familial settings. The native people of the Hill and Dale, the Roags and Ghyrans, originally hailed from the Denagothian Plateau, with the latter coming as part of Essuria’s colonial period. The elves and humans of the Parthenal are descended from refugees from collapsing Forenath in the Northern Wildlands. Frogfolk took advantage of the situation and migrated from the Swamp of the Beast south to the Moors of Chlyras. The expansion of the Dominion of Maggorath spurred giants and ogres to leave the Icereach and occupy the eastern Wildlands and northeastern Wendar. Jason Silverheart, first paladin of He Who Watches, died defeating the Baamor Fiends of the Wildlands. His war-bride perished during a bandit ambush in that region’s Fuin River Valley, a site that also claimed Thyatis’ Lost Legion. Ghyr is formally neutral towards the member-nations of the Western Alliance, who failed to pledge fealty to King Ganto of Ghyr and are held to be in rebellion. The Kingdoms of Greendale and Deep Hollow have trouble with the Kingdoms of 200 Knights and of Many Colors. All three nations are troubled by Hillban tribes. In addition, Ghyr is troubled by soldiers and bandits from the Kingdom of Denagoth as well as the Den Horde and various humanoids in the southern Piedmont. The kingdoms occasionally hire Hagommerian mercenaries to bolster their forces. Ghyr and the other modern nations were briefly part of the Thyatian territory Provincia Gurrania during the Empire’s colonization period a century ago. Their freedom buyout disappeared along with the Lost Legion. Ghyr’s small trade with Oceansend ended after the recent Desert War against humanoids and Denagothians. It could be replaced by trade with the halflings of Leeha. LJN Characters and Concepts: The majority of characters, creatures, and places associated with the LJN toy line have been adapted for use here, including Strongheart, Mercion, and Warduke. Character backgrounds have been adapted for GazF, and characters are presented as just prior to the Quest for the Heartstone. Jason and Blue Jay: Jason Silverheart, the first paladin of He Who Watches, primarily fought against the Dominion, but he died while defeating the Baamor Fiends of the Northern Wildlands. His helmet remains at the Shrine of the Black Wing as the Haunted Helm. Those who don it are pulled towards the Fuin River Valley and the lair of Fafnimorn, where his war-bride, Blue Jay, fell in ambush during his absence. Conflicts with Official Material: The only potential point of canonical contention relates to the inclusion of the LJN characters. Strongheart, Mercion, Figgen, and Paralay are mentioned in the context of Ierendi in both X10 (where the first two are presented as an elderly king and queen) and/or “color” sections of Gaz4 (but the regents are different adventurers). Some fan works interpret this to mean that the Quest for the Heartstone has already been completed by the start of the modern 1000 AC era. Standards: The flags of Ghyr, Greendale, and Deep Hollow are included on the map The Western Alliance. Idris Darkelf: Idris Darkelf originally appeared as an NPC in AC1, predating the use of "Idris" in Denagoth by several years. This thread might be of relevance for the Ghyr gazetter. As I said before, there's nothing canonical in it. The only thing noteworthy is that, apparently, Kelek is "in the employ" of Warduke - who also appears in the book. Other apprearances are from Figgen, the guild leader of the thieves' guild, Foxfingers, an evil thief, and someone named Princess Mirra, who is in possession of a gem called the Ruby of the Seven Suns. The gem does not seem magical, though "brave warriors have killed to keep possesion of the ruby." I think (if memory serves) that Figgen was in X10 Red Arrow, Black Shield, as a ruler of Ierendi, along with Strongheart, and some others. Strongheart and Warduke also appeared in XL1 Quest for the Heartstone, if memory (also) serves. I think takes place in Ghyr. I don't recall the others from any written adventure or accessory, though they all appear in the puffy sticker sets (except Princess Mirra). I wonder if all of the puffy sticker characters are accounted for in other TSR products. *the puffy stickers list them as half-elves. Did I just come across a couple of new Ghyr characters there? Just looked up X10; King Strongheart and Queen Mericon are the current monarchs of Ierendi (Stronghart is refered to as "elderly"). The court is said to consist of the dwarf Elkhorn, the wizard Ringleron, the elf Peralay, and the halfling Figgen, all of whom are in retirement. X10 doesn't give any stats for them (refering the reader back to XL1 and AC1) but does suggest that they are all Companion level and retired by the time Strongheart and Mericon ascended the throne. I don't own XL1 or AC1, maybe they have some more info? "I'll fire aimlessly if you don't come out!" Sorry Havard, they were included along with about 1/3 of the LJN characters (mostly the rare finds like the puffies) in the Western Alliance. and someone named Princess Mirra, who is in possession of a gem called the Ruby of the Seven Suns. These are indeed unknown to me. I had only cursory information on a few story/coloring books. All of these supplemental things never specify their location as being tied to Ghyr. In fact, the LJN were "ported" into Ghyr and then AC1. I wonder if all of the puffy sticker characters are accounted for in other TSR products. Doubtful. Many of the second-tier puffies never say the light of day anywhere else in the LJN line. Metal is correct on the rulership in X10. As to AC1 vs XL-1, they each have characters not present in the other (and not every AC1-LJN character is written as having gone through the Quest for the Heartstone), and the stats are changed not only in level but also a few attributes. Ah, I didn't think to check that one! Well done OldDawg! Possibly food for future proucts? Maybe Princess Mirra is the ruler of a yet to be explored realm? The Realm of the Seven Suns perhaps? That could be an indirect reference to the Hollow World (i.e., the sun always shines - seven days for seven suns, etc. ), or it could possibly be a reclusive kingdom in the far, far north (possibly a hidden valley on Frosthaven, unknown even to the giants) where geothermal vents have created a hidden, lush valley governed by Queen Mirra. Just a thought. I'd prefer just a ruby with 7 glowing lights within it. Mirra is just one more lady of of the court, possible a future betrothed to one of the princes of the Hill and Dale. Dear friends: Mmmm... I am looking for the stats of the Frogfolk of Ghyr FGaz. I remember I read a table with levels, XPs, etc... but in the Ghyr FGAZ here in The Piazza and in the Pandius copy I can not find it!!!! Where could I find those dear frogfolk? "Glantri needs some re-shaping; a million dwarves would help!" Khuzd wrote: Where could I find those dear frogfolk? 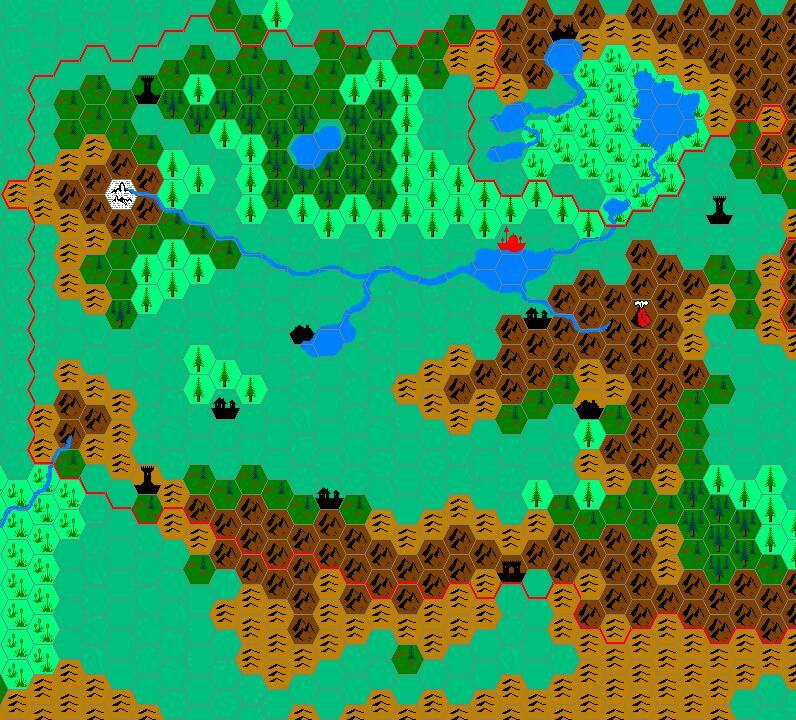 The frogfolk appeared in Gaz F3 The Northern Wildlands.